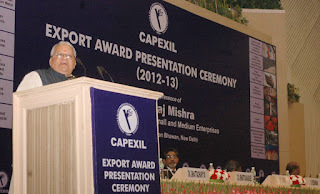 CAPEXIL Export Awards 2012-13 were presented by the Minister of Micro, Small & Medium Enterprises Shri Kalraj Mishra in the Capital today. The awards were given in the category of 3 Highest Export awards, 16 Top Export Awards, 63 Special Export Awards and 136 Certificates of Merit. Giving away the awards, the MSME Minister said that the focus of the govt is on Ease of Doing Business so that the entrepreneurs, particularly in the MSME sector, are freed from all complications so that they are facilitated in their efforts to increase exports. Highlighting the efforts made by MSME Ministry, Mr. Kalraj Mishra said that two months back, a radical simplification was carried out in the process of registration by creating an online Udyog Aadhar Portal which now only has one-page form. The Minister said that online filing on this portal can be done in just three minutes to get registration without spending any money. Highlighting the success of such efforts on Ease of Doing Business, the MSME Minister said that more than 1,60,000 registrations have taken place within two months of launch of the Aadhar portal. Highlighting that the flow of credit to the MSME sector was of paramount necessity for increasing exports, Mr. Mishra said that provisions have been made for collateral free loan for an amount of upto Rs.1 crore. The Minister praised the MSME entrepreneurs for having withstood the global slowdown and ensuring export growth in the MSME sector. Mr. Kalraj Mishra said that MSME is a sector that projects a nation to growth. When the entrepreneurial mentality develops, self-reliance will also happen. Earlier, delivering the address as the Guest of Honour, Mr. Arvind Mehta, Additional Secretary, Ministry of Commerce, said that the contribution of MSME was notable in ensuring a consistent growth in the exports from this sector notwithstanding an overall slowdown in the global economy. The Highest Export Award for 2012-13 under the Canalised Agency (Minerals and Ores Sector) was given to M/s MMTC Limited, New Delhi. Under the Processed Minerals category, the award was given to M/s National Aluminium Company Ltd.(NALCO), Bhubaneswar. Under the Non-Minerals Sector, the Highest Export Award was given to M/s Balkrishna Industries Ltd, Mumbai. CAPEXIL, an Export Promotion Council, functioning under the Ministry of Commerce & Industry was set up to facilitate and promote export of Chemical based Allied Products. Total export of products falling under the jurisdiction of CAPEXIL during 2014-15 was an impressive $13.93 billion. CAPEXIL has 16 panels, which are broadly divided into two categories viz. minerals and non-mineral.